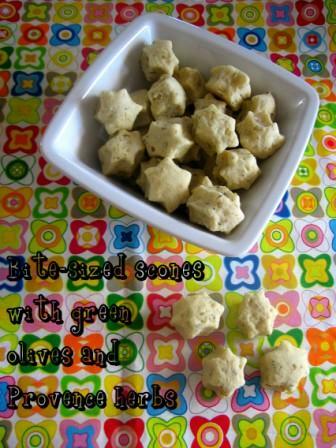 Those tiny, savory scones make a great appetizer alternative. The recipe comes from one of Trish Deseine’s books, and it is the only one I have been making since. It is almost perfect: the dough is smooth and real easy to work with. You can cut it with a cookie cutter and then give your scones fancy shapes. Provence herbs (thyme, marjoram, rosemary, tarragon, fennel, chervil) and green olives give a summery feel to these scones and with the temperatures drowning, it is really nice! In a large bowl, combine the flour, sugar and baking powder. Stir in the butter by rubbing the mixture between your fingers until it looks like breadcrumbs. Add parmesan and milk, a little at a time, and mix to form a soft dough. Finally add the chopped olives and the herbs. Knead well, adding flour if needed. 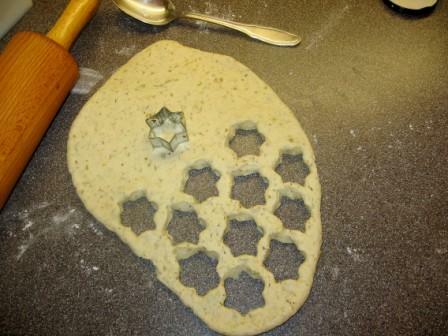 Roll the dough out on a lightly floured surface to 2 centimeters in thickness. Cut small shapes with a cookie cutter. Place scones onto a baking sheet and brush tops with milk. Place in the oven for 7 minutes. I’ve discovered cranberries quite recently and I really like these tiny, ruby-red berries. They’re still difficult to find in France, but Germany is not too far and dried cranberries can be found more easily there. 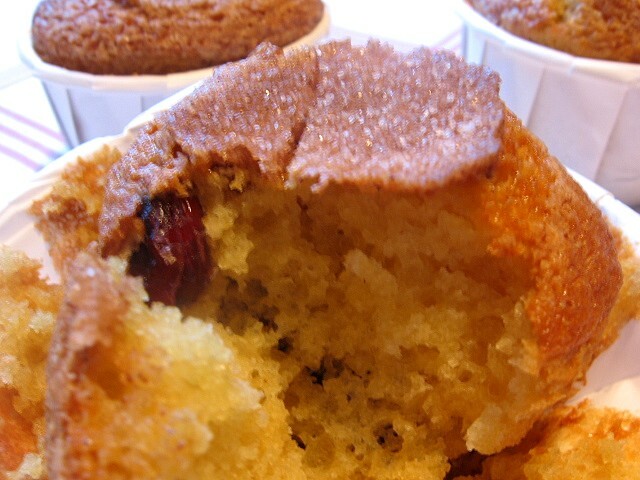 I found the recipe for these cranberry muffins under the name of « Christmas-Morning Muffins » in one of Nigella Lawson’s books. I know, it’s not yet Christmas, but I couldn’t resist this cinnamon-sweet smell of baking and decided to make them for this month’s Garden Cook Event. They’re really easy to put together and the smell of nutmeg, cinnamon and orange is gorgeous! 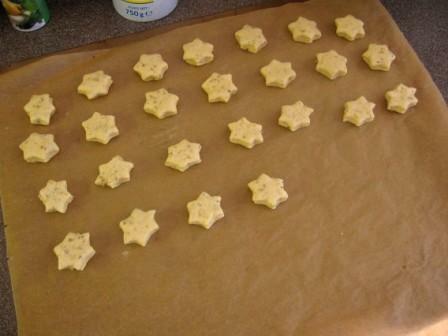 I’ll sure be baking them again for this year’s Christmas! for the topping: 2 teaspoons sugar + 1/2 teaspoon cinnamon. In a large bowl, combine the flour, baking powder, baking soda and sugar. Grate over a generous amount of fresh nutmeg. Squeeze the orange or clementine juice into a measuring cup, then pour in milk on top till it comes up to the 2/3 cup mark. Add the melted butter and the egg, and beat to combine. Pour the liquid ingredients into the bowl of dry ingredients and stir till the ingredients are more or less combined, remembering that a lumpy batter makes lighter muffins. 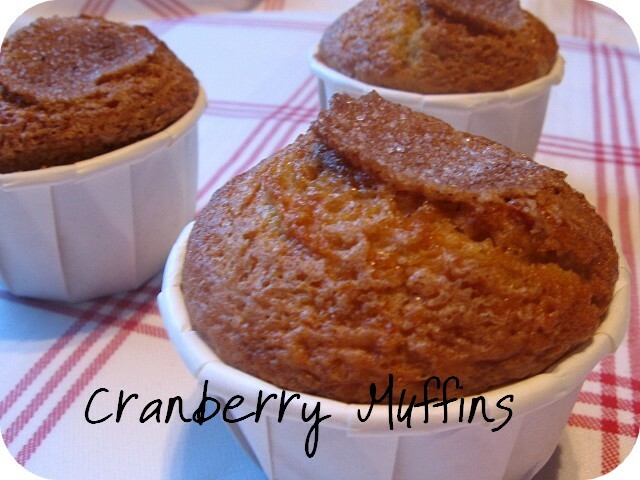 Last of all, lightly fold in the cranberries and fill the muffins cups. [The amount of cranberries specified in the recipe here makes for heavily fruited muffins; if you want them sparser, use half the amount]. Mix together the sugar and ground cinnamon and sprinkle over the tops of the muffins. Stick them in the oven and bake for 20 minutes. Here’s my contribution to this special event! 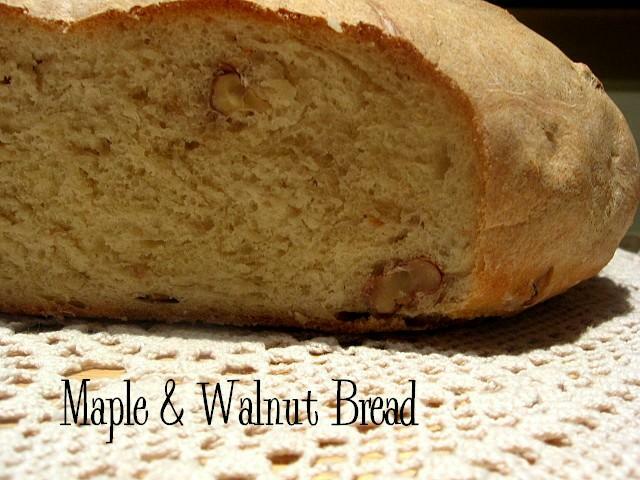 I chose to bake a walnut bread, enriched with maple syrup. The recipe comes from Nigella Lawson’s book « How to be a domestic goddess ». I substituted pecan nuts with walnuts, as I prefer them. But feel free to use any nuts you want! Don’t let the maple syrup put you off, the crumb is not overly sweet. oil (walnut oil, if you’ve got some) for greasing. Combine the flour, salt and yeast in a large bowl. Stir the maple syrup in the warm water. Pour the liquid into the dry ingredients and stop when you’ve got a rough dough. Knead for a few minutes, then leave to rest for 20 minutes. Start kneading again, sprinkling in the nuts. 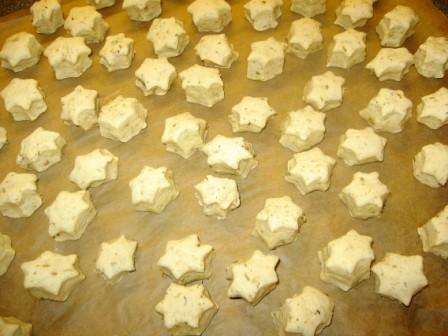 Carry on kneading until the dough feels smooth and elastic and then form into a ball. Grease a bowl with oil; and turn the dough ball in the oil, so that the top is lightly slicked with it too. Cover the bowl with plastic wrap and leave to rise in the kitchen for 1 or 2 hours or until about doubled. Punch the dough down, knead for 1 minute, and then form into a loaf. Set this loaf on a baking sheet, cover with a tea towel, preheat the oven to 210°C, and leave the dough for about 30 minutes or until puffy. Score the loaf with a blade or a sharp knife and transfer to the oven. After 15 minutes, turn the temperature down to 180°C and give a further 20 minutes. Check the bread’s ready by rapping its bottom, then transfer to a wire rack to cool. 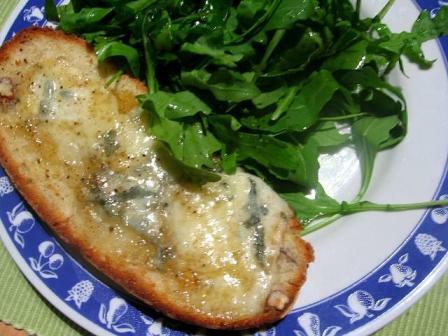 This bread goes especially well with blue cheese. 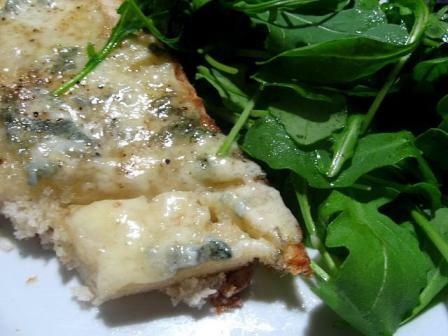 Cut a slice, top with blue cheese and pop in the oven a few minutes until the cheese melts. Add a dollop of honey and enjoy! You’ll find the complete round-up and participations of other bloggers here at Zorra’s!